Evanescence is the third studio album by American rock band Evanescence. It was released on October 7, 2011, by Wind-up Records. The band began writing the album in June 2009. Its release was delayed several times; on February 22, 2010, the band entered the studio with producer Steve Lillywhite but later stopped working with him because he "wasn't the right fit". At the time the album was scheduled for an August or September 2010 release, but Lee later announced that Evanescence had suspended recording to write more material. On April 11, 2011, the band returned to the studio with producer Nick Raskulinecz. According to Lee, the band brought influences from Björk, Depeche Mode, Massive Attack, MGMT, and Portishead to the album. Evanescence's songs contain sounds and influences characteristic of nu metal, hard rock and electro. Although the album received generally positive reviews from music critics, who praised Lee's vocals and its innovative sound, some noted a similarity to the band's older material. Evanescence debuted at number one on the Billboard 200 chart with 127,000 copies sold in its first week, and topped four other Billboard charts; Rock Albums, Digital Albums, Alternative Albums, and Hard Rock Albums. The album was successful worldwide, appearing on the charts of over 20 countries. The band promoted Evanescence by premiering songs online on a number of websites and appearing on several television shows. The first single from the album, "What You Want", was released on August 9, 2011; "My Heart Is Broken", the album's second single, was released on November 11. "Lost in Paradise" was released internationally as its third single on May 25, 2012, and "The Other Side" was serviced to US modern rock radio stations as a promotional single on June 11. In 2011 the band embarked on the Evanescence Tour, their third worldwide tour, to promote the album with The Pretty Reckless and Fair to Midland. After finishing a tour to promote Evanescence's previous album, The Open Door, Amy Lee said that she "just sort of took off and didn't know what I was going to do next." According to Lee, she was unsure at the time when—or if—Evanescence would continue. After taking a break from music for 18 months, she decided she wanted to work with the band members and it "became more of a group project". Lee admitted to an identity crisis: "[The success with] Fallen happened really fast, and it was just go, go, go for a couple years, and we went right into writing and wrote the next record. By the time we finished touring with The Open Door, I just needed to go, 'Who am I as an adult?'" During her hiatus, Lee began painting, attended concerts and museums and listened to folk and indie music. In a June 2009 post on the Evanescence website, Lee wrote that the band was in the process of writing material for an album planned for release the following year. According to Lee, the music would be an evolution of previous work and "better, stronger, and more interesting". She described Evanescence's music as epic, dark, big, beautiful and desperate. In a Spin interview, Lee called the record "fun", which, according to her, was a "totally new thing" for the band: "When I listen to our old music I see that's where I was in my life at that time. This has been a long trip and parts have been hard. But it's about not taking everything so seriously this time." Writing for the album began in 2009, when Lee wrote an electronic-driven song different from her usual style. She said, "I remember listening to it over and over, just obsessing over it the way I used to obsess over Evanescence music. That was the spark for me – and the spark to go in the electronic direction and bring some of that into what Evanescence is doing." Unlike the band's two previous albums (primarily written by Lee), every band member contributed to the writing process. Evanescence entered the studio on February 22, 2010, to begin recording the album. Will Hunt returned as drummer; a second drummer and programmer, Will "Science" Hunt, was brought in to assist with writing but did not join the band. David Campbell, who previously worked with Evanescence on The Open Door, was brought back to handle string arrangements and the album was scheduled for release by producer Steve Lillywhite. Lee later said that Lillywhite "wasn't the right fit", adding that the band was experimenting and when they tried to record the songs Lee wrote without the band "it wasn't working." According to Lee, the slow, acoustic songs written with Lillywhite did not mesh with Evanescence's sound. When the band began recording with Lillywhite, the album was intended for an August or September 2010 release. However, on June 21, 2010, Lee announced on EvThreads.com that Evanescence had suspended recording to continue work on the album and "get our heads into the right creative space". According to Lee, Wind-up Records was experiencing "uncertain times" which would further delay the album's release. Label president Ed Vetri supported Lee's decision: "One thing we do at Wind-up is, we're patient. I[f] it's not right, it's not coming out. If it takes a year or four years, [we're] going to take the time it needs to write the right record." After visiting the studio several times to see the album's progress, Vetri said that "her core fans will be really happy." I've come to realize now I was making like a solo record, and if it was going to be an Evanescence record, we needed to come together and make it like a band. That was a hard time for me. I thought I knew what I wanted and it sort of didn't happen like I wanted it to ... But I have to say I feel so strong about what we're doing now ... We still have some of the same songs from those sessions but we've made them about the band. Nick is an awesome producer. He really helped me get the plan and have confidence in the decisions that we made. For me, I have a lot of ideas and sometimes it just comes down to "OK, everything that I'm doing I have two options!" He's awesome, because as I'm doing these things I'm asking him from the vocal booth or the piano room or whatever, "Which one of these should I do?" He's good at helping me make a quick decision. I really trust his opinion because he makes great records. In December 2015, Lee posted a cover of "Baby Did a Bad Bad Thing" by Chris Isaak, which she stated was originally intended to appear on the album produced by Lillywhite in 2010. She also further explained that the original album did not share any of the same tracks that the version produced by Raskulinecz had, as the record company rejected these recordings. Lee said she used her frustration with being forced to start over to write what she called "(Evanescence's) heaviest album." In a June 2011 Kerrang! interview, Lee said that the album would be self-titled and was "about the band; it's more of a band record." Lee explained that the concept "to me is about falling back in love with this thing, with Evanescence, with what I've obsessed over for a decade, longer than that." There were originally many album-title ideas, but Lee said that as the project became more collaborative "it just felt like this is who we are, it's a band. And to have that feeling in the music where the band is so pumped up, it was just the only title that felt right. It's about falling back in love with this thing in a major way." In an MTV News interview, she said that 16 songs had been recorded but not all would be included on the album. It was later decided to release two versions of the album: a deluxe edition with all 16 songs and a standard edition with 12. Evanescence's cover artwork was introduced on the band's website on August 30, 2011. It is their first album cover which does not feature Lee. In an interview, she discussed the cover: "Well, both of our other records are me on the cover, and I think it's cool to have that photo, you know, that people can look at and go, 'OK, that's who that is.' But I feel like, by now, they know who we are, and I wanted something really different. I didn't feel like we had to put a photo on the cover, I wanted it to be more mysterious and more about Evanescence itself, not just me." 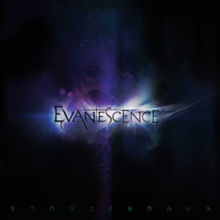 The cover, black with vapor behind the band's name, is a play on the meaning of "evanescence" ("to dissipate like vapor"). Looser. This album is not so glossy or tight. It's more instinctive. It's big on groove and there's some real musicianship that we're really proud of. Everyone knows our sound but that's just a foundation and we've danced on top of that! It's still very heavy and dark but we were having fun with it. During the Steve Lillywhite sessions, Lee described the album as a "rainbow of sounds" with heavy, stripped-out songs. According to Lee, it had electro influences and a lot of drum programming. During the later sessions with Nick Raskulincecz, she discussed two of the album's themes: brokenness ("Brokenness has become a little bit of theme, without necessarily offering a solution") and oceans. In a later MTV interview, Lee mentioned other themes: "the quest for freedom, and then there's songs that are just about falling in love". She said that Evanescence used new and vintage instruments (such as a harp, synthesizers and the Moog Taurus Pedal) and recorded the ballads "Secret Door" and "My Heart Is Broken". In a Kerrang! interview, Lee said she was inspired by her life and personal relationships. Lee cited Björk (pictured) as an influence on Evanescence. According to Lee, the album was fun but not in a "poppy way" and the band enjoyed its recording. She was inspired by her relationship with Evanescence's fans: "I can really hear myself singing about my relationship with Evanescence and with the fans. There's always one big relationship on a record that I sing about the most. I feel like my big relationship on this album [is] with Evanescence itself, and with the fans. I think lyrically you're hearing a lot about a relationship, a struggle with a relationship or love in a relationship, and mostly I'm singing about that." For the album, the band was influenced by artists such as Björk, Depeche Mode, Massive Attack, MGMT, and Portishead. Lewis Corner of the Digital Spy website noted that rumbling guitars and dainty strings were present on most of the album's songs: "Amy Lee declares over roaring guitars and classical strings, reinforcing their medieval influences as opposed to the electronic sound they've been purporting." Lee shares writing credits with other members of the band on 11 of the standard-edition album's 12 songs. Evenescence's first track and lead single, "What You Want", was described as one of the band's most unusual songs with heavy guitar melodies, loud drums and a freedom theme. Opening with drums and a synchronized synthesizer, Lee sings "Do what you, what you want / If you have a dream for better / Do what you, what you want / 'Til you don't want it anymore" before the song's rhythmic, guitar-driven beat. Lyrically, the song explores a relationship which is not working out, despite present love. "Made of Stone", one of the album's oldest songs, has heavy-metal influences. "The Change" (originally entitled "Purple"), which begins gently and grows more insistent, has been compared to "Digital Bath" by the American alternative metal band Deftones. The fourth track (and second single), "My Heart Is Broken", is a ballad written for harp and recorded with a piano. It begins with the piano and Lee's vocals, evolving into rhythmic guitars and strings. In the chorus Lee sings, "I will never find a way to heal my soul/ And I will wander 'til the end of time/ Torn away from you/ My heart is broken". The fifth track, "The Other Side", has churning, chunky guitars, a double-bass drum and Lee's "ethereal, widescreen" vocals with elements of R&B. Lyrically, the song's theme is death. "Erase This", formerly titled "Vanilla", was noted by Mary Ouellette of Loudwire as an "uptempo rocker" similar to "What You Want" which would sound better played live rather than through earphones. "Lost in Paradise" is a symphonic rock ballad which begins with piano, strings and Lee's unlayered vocals before adding the band for the song's climax; its lyrics reflect Lee's past struggles, apologizing to her fans for the band's five-year absence. The song's musical structure was compared to "Jóga", by the Icelandic recording artist Björk. "Sick" has a loose, lazy melody and a chanted chorus; one of the first songs written for the album, it "set[s] a heavy direction for the rest of the record." "End of the Dream" begins "full bore with chunky guitar, then falls into a brooding grove with piano underpinning Lee's unmistakable vocals." In the chorus, Lee sings "Follow your heart 'til it bleeds," evincing the track's "seize the day" message. Lee said about the song, "It's about understanding that this life isn't forever, and how you have to live it, embrace even the pain, before it's all over. As much as it hurts, it just means you're alive. So don't be so afraid to get hurt that you miss out on living." "Oceans" begins with a big, low synth and a vocal before the band joins in. According to Lee, "It's big and lush. We've been having a lot of fun playing that one especially." "Never Go Back" (originally called "Orange") examines "loss from the perspective of someone losing someone in a tragedy". Lee said that the song, with the lyrics "It's all gone, the only world I've ever known", was inspired by the 2011 Tōhoku earthquake and tsunami. "Swimming Home" is an electro-pop song with grinding guitars and a "weeping" piano. Evanescence was first released in snippets, with portions of "What You Want", "The Other Side" and "Lost in Paradise" previewed on MTV News on July 11, 13 and 15 respectively. Several songs were made available online, including "The Other Side", which premiered on September 21 at Hot Topic; "My Heart Is Broken" on September 27, and "End of the Dream" on Spin on October 4. All songs became available on Spin on October 7. A Renholdër remix of "Made of Stone" appears on the soundtrack and in the closing credits of the film Underworld: Awakening, and a Photek remix of "A New Way to Bleed" is on The Avengers soundtrack Avengers Assemble: Music from and Inspired by the Motion Picture. On August 8, Evanescence appeared on "MTV First: Evanescence" to introduce the album's first single, "What You Want", with a live performance and an extended interview. Lee went to Toronto's Liberty Studios on August 22 to preview five mastered songs from the new album ("What You Want", "The Change", "The Other Side", "My Heart Is Broken" and "Lost in Paradise") to a selected audience of 30. Evanescence appeared at the Rock in Rio festival on October 2, 2011, performing "What You Want", "Made of Stone", "The Change", "The Other Side", "My Heart Is Broken", "Sick" and several songs from their previous two albums. Before Evanescence's US release, Lee appeared on the Billboard website on October 11 to promote the album. The band appeared on Jimmy Kimmel Live! on October 15, performing "What You Want" and "Going Under". On December 12, Evanescence appeared at the Nobel Peace Prize Concert, where they performed "Lost in Paradise" and 2003's "Bring Me to Life". On February 1, 2012, the band performed "My Heart Is Broken" on The Tonight Show with Jay Leno, and two days later they played "Made of Stone" and "The Other Side" on Conan. 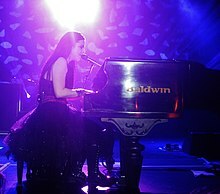 Evanescence began their tour to promote the album with a concert at War Memorial Auditorium in Nashville, Tennessee, on August 17, 2011. This was followed by performances at Rock on the Range in Winnipeg on August 20, Rock in Rio on October 2 and at the José Miguel Agrelot Coliseum in Puerto Rico on October 6. The band began the first US leg of their tour on October 10 in Oakland, California, and finished it in New York City. Evanescence then played several concerts in the United Kingdom, beginning at London's Hammersmith Apollo on November 4 and finishing the leg on November 13 at the O2 Academy Birmingham. Supported by The Pretty Reckless, Fair to Midland and Rival Sons, the tour's set list included songs from Evanescence's three albums. Lee said, "We're definitely focusing mainly on the new material. We're really excited about that music the most – obviously it's the newest – but of course we'll be playing some from both of our other albums too. I guess I'd say in general, our show's on the heavy-energy side, so we'll be running around singing a lot of fast songs." The Evanescence Tour continued in 2012 with concerts in the United States, Asia and Europe, including Lisboa V in Portugal and Rock am Ring in Germany. Their South American tour began on October 4 in Porto Alegre, Brazil, and the band returned to the UK for four shows in November. Evanescence also played on the Carnival of Madness tour with Halestorm, Cavo, New Medicine and Chevelle. That tour began on July 31, 2012, at the Prairie Capital Convention Center in Springfield, Illinois and ended on September 2 at the Outer Harbor in Buffalo, New York. "What You Want", the album's first single, was released digitally on August 9, 2011. The song's lyrics are about freedom, one of Evanescence's themes. It debuted at number one on the UK Rock Chart, making Evanescence the artist with the most number-one singles on the chart in 2011. "What You Want" peaked at numbers 68 and 72 on the Billboard Hot 100 and UK Singles Chart, respectively. Its video, filmed in a Brooklyn, New York warehouse on July 30, 2011 with the band performing the song live, was directed by Meiert Avis and released on September 13. "My Heart Is Broken" was distributed to hot, modern and adult-contemporary radio stations on October 31, 2011 and to pop stations the following day as the album's first mainstream single. Its video was released in January 2012, and the song was distributed to alternative and modern-rock stations on February 13. The next mainstream single, "Lost in Paradise", was released internationally on May 25. Its video, released on February 14, 2013, focuses on Evanescence's tour with footage of the band performing the song filmed by fans around the world. "The Other Side" was a promotional single which was distributed to modern-rock stations on June 11 and alternative stations the following day. Although a lyric video was uploaded to the band's YouTube channel on August 30, 2012, Lee said that no other video would be made for the song. Evanescence has received mostly positive reviews from music critics. Metacritic assigned an average score of 63 to the album based on nine reviews, indicating a generally favorable reception. Before its release the album appeared on several lists, including Spin's "26 Fall Albums That Matter Most", Entertainment Weekly's "Fall Albums We Can't Wait to Hear" and Rolling Stone's "Fall Music Preview: The Season's Hottest Albums". Steve Beebee of Kerrang! gave the album five stars out of five, calling it "easily their most cohesive and confident work" and their "best album to date". According to Rick Florino of Artistdirect, Evanescence was "their best album to date and a new classic" and "[they] manage to experiment while staying unshakably infectious. That's not an easy feat, and few acts manage to do that." AllMusic's Stephen Thomas Erlewine praised Raskulinecz's production, Lee's vocals and the "fair share of crossover hooks", adding that the band sounded "less tortured tonally even if it remains quite dramatic." Entertainment Weekly's Kyle Anderson said, "When [Lee] uses baroque orchestral accoutrements to wage an air assault on her demons ... she's more than just the token girl in the pit." Lewis Corner of Digital Spy gave the album four stars out of five, saying that the band's trademark sound was present on the album "and truth be told, we wouldn't want it any other way." Mark Lepage of the Montreal Gazette praised the album, calling it "one rolling, chugging, plangent epic." According to Chad Grischow of IGN, Evanescence is a "great album that delivers the familiar while keeping an eye on the future." Rob Williams of the Winnipeg Free Press described the album as gothic nu metal and hard rock, with dramatic orchestration which makes everything sound "big and alive": "With so many extra bells and whistles, despair has never sounded so epic." Marc Hirsh of The Boston Globe wrote that the album captures "each party elevating the other far above where their proclivities would get them on their own." According to Nick Catucci of Rolling Stone, Evanescence is primarily a "syrupy mix of piano, guitar and strings" which is not as "saucy" as the band's older material. Chris Willman of Reuters wrote, "Every interchangeable tune on the new album also sounds designed to play over the end credits of an action blockbuster that takes itself too seriously". Theon Weber of Spin gave the album a mixed review; rather than holding back too much, Weber wrote, Lee did not do enough to restrain her performance: "Evanescence gets lost in the cavernous spaces carved out by their unsecret weapon." Edna Gundersen of USA Today criticized Raskulinecz's production and the album's electronics: "Tempered, [Lee's] emotional wail enhances the hypnotic medieval magic of signature Evanescence tunes. Some electronics slip into the mix, but the band's rock essence and penchant for weepy strings remain prominent, as does its flair for conveying wretched despair." Although PopMatters' Dane Prokofiev criticized the album's eponymous title as a new-band strategy, he praised the "noticeable increase in the prominence of choir singing, tinkling piano motifs, and the silky sound of string instruments" with the caveat that the additional deluxe-edition songs were superior to those on the standard edition. He also noted a turn in the band's sound to match that of symphonic metal. Steven Hyden of The A.V. Club called the album "narcissistic", "corny" and "irredeemably stupid". What can I say, we're thrilled about it! We made an album that we're really proud of and now we get to watch it fly. We weren't expecting this and we're just so grateful to our fans. Evanescence debuted at number one on the Billboard 200 with first-week sales of 127,000 copies, becoming the band's second album to debut atop the chart. The first week's sales were lower than those for Evanescence's previous album, The Open Door, which sold 447,000 copies in its first week. The album fell to number four the following week, selling over 40,000 copies. Evanescence also topped the Digital Albums, Top Rock Albums, Alternative Albums, and Hard Rock Albums charts in the United States, and was 2011's 141st best-selling album in that country. As of August 2012[update], Evanescence had sold 421,000 copies in the US. The album sold more than 2,000 copies on its first day of sales in the United Kingdom and debuted at number four on the UK Albums Chart with 26,221 copies sold in its first week. It was certified gold by the British Phonographic Industry (BPI) on August 22, 2014, denoting shipments in excess of 100,000 copies. The album entered the Canadian Albums Chart at number two, selling 9,000 copies in its first week. On January 12, 2012, the album was certified gold by Music Canada for shipments of over 40,000 units in Canada. Evanescence debuted and peaked at number five in Australia, was certified gold by the Australian Recording Industry Association (ARIA) for shipments of over 35,000 copies. 4. "My Heart Is Broken"
9. "End of the Dream"
13. "A New Way to Bleed"
Credits adapted from the liner notes of Evanescence. William B. Hunt – additional programming on "Swimming Home"
^ a b c d e f g h Titus, Christa (June 20, 2011). "Amy Lee: New Evanescence Album is 'Much More of a Band Collaboration'". Billboard. Archived from the original on May 29, 2013. Retrieved June 21, 2011. ^ a b Kara Warner; reporting by James Montgomery (August 9, 2011). "Evanescence Say Making New Album 'Felt Like The First Time'". MTV News. Archived from the original on September 2, 2011. Retrieved August 9, 2011. ^ a b c d Sterdan, Darryl (October 11, 2011). "Evanescence comes back to life". Toronto Sun. Retrieved October 11, 2011. ^ Hartzler, Amy (June 19, 2009). "News: Will the real Slim Shady please stand up?". Evanescence.com. Archived from the original on June 24, 2009. ^ a b c d Montgomery, James (June 23, 2011). "Evanescence Return With 'Dark, Beautiful' Self-Titled Album". MTV News. Archived from the original on June 25, 2011. Retrieved June 23, 2011. ^ a b c d e f Goodman, William (April 13, 2011). "Amy Lee Talks Evanescence's Comeback LP". Spin. Archived from the original on August 10, 2011. Retrieved June 21, 2011. ^ Goodman, William (March 5, 2010). "Exclusive: Amy Lee on the New Evanescence Album". Spin. Archived from the original on March 7, 2010. Retrieved March 6, 2010. ^ a b Weingarten, Christopher R. (March 2, 2010). "Evanescence Go Electro As Lee Has "Fun With Music" on Next LP". Rolling Stone. Archived from the original on January 8, 2012. Retrieved July 3, 2011. ^ Smith, Barnaby (February 24, 2010). "Steve Lillywhite Keen To Replace Cowell On 'American Idol'". Spinner. Archived from the original on July 4, 2013. Retrieved February 24, 2010. ^ a b c Graff, Gary (October 6, 2011). "Evanescence's Lee: Scrapped Material Could Resurface 'On Different Projects Someday'". Billboard. Detroit. Archived from the original on March 30, 2013. Retrieved October 6, 2011. ^ Florino, Rick (February 26, 2010). "Evanescence is Back". Artistdirect. Archived from the original on March 1, 2010. Retrieved March 1, 2010. ^ Lee, Amy (June 21, 2010). "What's up". EvThreads.com. Archived from the original on January 6, 2012. Retrieved June 26, 2013. ^ "Evanescence Heading Into The Studio For New Album" (PDF) (Press release). Wind-up Records. April 4, 2011. Archived (PDF) from the original on July 23, 2011. Retrieved June 21, 2011. ^ a b "Drummer Johnny Kelly Performs With Black Label Society For First Time; Video Available". Blabbermouth.net. February 26, 2011. Retrieved August 20, 2017. ^ a b Bliss, Karen (August 25, 2011). "Backbeat: Amy Lee Attends EMI Canada's Invitation-Only Playback Of New Evanescence Songs". Billboard. Archived from the original on October 9, 2012. Retrieved August 26, 2011. ^ a b c d Montgomery, James (July 11, 2011). "Evanescence's 'What You Want': Hear A Preview!". MTV News. Archived from the original on July 13, 2011. Retrieved July 11, 2011. ^ a b c "Evanescence's Amy Lee: 'It's been too long since our last album'". NME. September 23, 2011. Archived from the original on September 26, 2011. Retrieved September 25, 2011. ^ Lee, Amy. "Cover #4: Baby Did a Bad, Bad Thing". Facebook. Retrieved December 18, 2015. ^ a b "We're Breaking All the Rules!". Kerrang!. June 25, 2011. p. 8. ^ a b Montgomery, James (August 3, 2011). "Evanescence Tour Will Be 'Straight Up Rock'". MTV News. Retrieved August 4, 2011. ^ a b c d Montgomery, James (September 14, 2011). "Amy Lee Says Album Art 'About Evanescence, Not Just Me'". MTV News. Archived from the original on November 25, 2011. Retrieved September 15, 2011. ^ Goodman, William (March 5, 2010). "Exclusive: Amy Lee on the New Evanescence Album". Spin. Archived from the original on March 7, 2010. Retrieved July 3, 2011. ^ O'Donnel, Kevin (November 2, 2010). "Evanescence Reveal Details of Risky New Album". Spin. Archived from the original on April 21, 2011. Retrieved July 3, 2011. ^ a b Montgomery, James (June 27, 2011). "Evanescence's New Album 'All Over The Place,' Amy Lee Says". MTV News. Archived from the original on June 30, 2011. Retrieved June 28, 2011. ^ "Evanescence's Amy Lee: 'Our new album is about our fans'". NME. August 5, 2011. Archived from the original on October 30, 2011. Retrieved August 6, 2011. ^ "I'm Dying For the Fans to Hear This". Kerrang!. August 6, 2011. p. 7. ^ Baltin, Steve (July 20, 2011). "Evanescence's Amy Lee Thrilled to Return After Five-Year Break". Rolling Stone. Archived from the original on July 23, 2011. Retrieved July 21, 2011. ^ Graff, Gary (March 26, 2010). "Evanescence Recording New Album, Plots Summer Tour". Billboard. Detroit. Archived from the original on September 22, 2014. Retrieved June 28, 2011. ^ a b c Corner, Lewis. "Evanescence: 'Evanescence' – Album review". Digital Spy. Archived from the original on October 7, 2011. Retrieved October 7, 2011. ^ Montgomery, James (October 12, 2011). "Evanescence: Family Values". MTV News. Archived from the original on October 13, 2011. Retrieved October 12, 2011. ^ Shetler, Scott (August 9, 2011). "Evanescence, 'What You Want' – Song Review". Pop Crush. Archived from the original on August 30, 2011. Retrieved August 9, 2011. ^ a b Lamb, Bill. "Review: Evanescence – What You Want". About.com. Archived from the original on November 7, 2011. Retrieved August 11, 2011. ^ a b c d Evanescence Track By Track (Part 1) video. NME. Archived from the original on October 8, 2011. Retrieved October 17, 2011. ^ Titus, Christa (October 11, 2011). "Evanescence Returns to an Altered Rock Landscape". Billboard. p. 2. Archived from the original on June 21, 2013. Retrieved November 2, 2011. ^ a b c Bliss, Karen (August 23, 2011). "Amy Lee Previews New Evanescence Songs". Rolling Stone. Archived from the original on September 19, 2011. Retrieved August 25, 2011. ^ Florino, Rick (October 12, 2011). "Live Review: Evanescence – The Palladium, Hollywood". Artistdirect. Archived from the original on October 15, 2011. Retrieved October 12, 2011. ^ a b Copsey, Robert (September 28, 2011). "Exclusive: Evanescence unveil new album track 'My Heart Is Broken'". Digital Spy. Archived from the original on October 1, 2011. Retrieved September 28, 2011. ^ a b c Montgomery, James (July 13, 2011). "Evanescence's 'The Other Side': Hear A Preview!". MTV News. Archived from the original on July 15, 2011. Retrieved July 20, 2011. ^ Ouellette, Mary (October 10, 2011). "Evanescence, 'Evanescence' – Album Review". Loudwire. Archived from the original on November 17, 2016. Retrieved November 16, 2016. ^ a b c Montgomery, James (July 15, 2011). "Evanescence's 'Lost In Paradise': Hear A Preview Now!". MTV News. Archived from the original on July 18, 2011. Retrieved July 20, 2011. ^ a b c d e Beebee, Steve. "Evanescence – Evanescence review (Wind-up Records)". Kerrang!. Archived from the original on May 13, 2012. Retrieved November 20, 2015. ^ "Evanescence Track By Track (Part 2) video". NME. Archived from the original on October 12, 2011. Retrieved October 19, 2011. ^ a b c d Weber, Theon. "Evanescence, 'Evanescence' (Wind-up)". Spin. Archived from the original on October 6, 2011. Retrieved October 4, 2011. ^ Gaston, Peter (October 7, 2011). "ALBUM PREMIERE: Evanescence's Self-Titled Return". Spin. Archived from the original on October 8, 2011. Retrieved October 8, 2011. ^ a b c d e Gaston, Peter (October 4, 2011). "EXCLUSIVE: Hear Evanescence Song Premiere". Spin. Retrieved October 4, 2011. ^ Montgomery, James (August 11, 2011). "Evanescence's 'Never Go Back' Inspired By Japan Tragedy". MTV News. Archived from the original on October 15, 2011. Retrieved August 12, 2011. ^ "World Premiere! Hear Evanescence's New Song "The Other Side"". Hot Topic. Archived from the original on April 1, 2012. Retrieved September 21, 2011. ^ Murphy, Sarah (September 27, 2011). "Evanescence – "My Heart Is Broken"". Exclaim!. Archived from the original on October 1, 2011. Retrieved September 27, 2011. ^ Eames, Tom (December 29, 2011). "Linkin Park, Evanescence remixes on 'Underworld: Awakening' soundtrack". Digital Spy. Archived from the original on January 13, 2012. Retrieved December 30, 2011. ^ "The Cure, Linkin Park and Evanescence to feature on 'Underworld: Awakening' soundtrack". NME. December 29, 2011. Archived from the original on January 7, 2012. Retrieved December 30, 2011. ^ Maloy, Sarah (March 27, 2012). "Soundgarden Record First Song in 15 Years for 'Avengers' Soundtrack". Billboard. Archived from the original on March 17, 2013. Retrieved March 31, 2012. ^ Montgomery, James (August 4, 2011). "Evanescence To Premiere 'What You Want' Live On MTV". MTV News. Archived from the original on November 7, 2012. Retrieved August 4, 2011. ^ Montgomery, James (August 10, 2011). "Evanescence 'Screaming' To Get On 'Breaking Dawn' Soundtrack". MTV News. Archived from the original on October 7, 2011. Retrieved August 12, 2011. ^ Ribeiro, Guilherme (October 2, 2011). "Evanescence toca o bom básico no Rock in Rio" (in Portuguese). MTV Brasil. Archived from the original on April 1, 2012. Retrieved October 3, 2011. ^ "Evanescence Live Q&A Oct. 11 @ 4pm EST". Billboard. Archived from the original on March 30, 2013. Retrieved October 11, 2011. ^ "Evanescence Live Q&A". Billboard. Archived from the original on March 30, 2013. Retrieved October 11, 2011. ^ Hogan, Marc (October 14, 2011). "Watch Evanescence Pummel 'Jimmy Kimmel Live!'". Spin. Archived from the original on October 16, 2011. Retrieved October 15, 2011. ^ "Royals, Mirren honor Nobel Peace Prize winners". CBS News. December 12, 2011. Archived from the original on December 13, 2011. Retrieved December 13, 2011. ^ Hogan, Marc (February 3, 2012). "Lana Del Rey Steals Late-Night Spotlight From Nas, Evanescence, Korn". Spin. Archived from the original on February 5, 2012. Retrieved February 4, 2012. ^ a b Montgomery, James (August 1, 2011). "Evanescence's Amy Lee Reveals Tour Plans". MTV News. Archived from the original on January 8, 2013. Retrieved August 2, 2011. ^ "Evanescence Singer Interviewed By ExploreMusic (Video)". Blabbermouth.net. August 23, 2011. Retrieved August 20, 2017. ^ "Rock in Rio – Evanescence é a última banda confirmada" (in Portuguese). Rock in Rio. May 10, 2011. Archived from the original on August 7, 2011. Retrieved June 7, 2011. ^ "Music agenda: Jay-Z and Kanye West launch 'The Throne' tour". The Independent. London. September 16, 2011. Archived from the original on July 8, 2015. Retrieved September 21, 2011. ^ "COLISEO DE PUERTO RICO – José Miguel Agrelot". Coliseo de Puerto Rico (in Portuguese). Archived from the original on July 4, 2011. Retrieved July 3, 2011. ^ a b "Evanescence announce six-date UK tour – ticket details". NME. July 26, 2011. Archived from the original on November 13, 2012. Retrieved July 26, 2011. ^ Schoonmaker, Vaughn Trudeau; Elias, Matt (October 18, 2011). "Taylor Momsen Calls Opening For Evanescence 'Surreal'". MTV News. Archived from the original on October 20, 2011. Retrieved October 18, 2011. ^ Trudeau Schoonmaker, Vaughn (November 7, 2011). "Evanescence Tour Openers Rival Sons 'Real Dirty'". MTV News. Archived from the original on November 8, 2011. Retrieved November 8, 2011. ^ a b Elias, Matt (October 12, 2011). "Evanescence Plan More U.S. Tour Dates For 2012". MTV News. Archived from the original on October 13, 2011. Retrieved October 12, 2011. ^ "Third Annual Carnival of Madness". Carnivalofmadness.com. June 18, 2012. Archived from the original on May 6, 2013. Retrieved October 14, 2012. ^ "What You Want – Single". iTunes Store (US). Archived from the original on October 11, 2011. Retrieved August 9, 2011. ^ "Official Rock & Metal Singles Chart Top 40". Official Chart Company. August 28 – September 3, 2011. Retrieved August 20, 2017. ^ Grein, Paul (August 17, 2011). "Week Ending Aug. 14, 2011. Songs: Not Bad". Yahoo! Music. Archived from the original on July 11, 2012. Retrieved September 15, 2011. ^ "Evanescence | Full Official Chart History". Official Chart Company. Retrieved August 20, 2017. ^ Montgomery, James (August 1, 2011). "Evanescence's 'What You Want' Video: Go Behind The Scenes Now!". MTV News. Archived from the original on October 15, 2011. Retrieved August 2, 2011. ^ Lipshutz, Jason (September 13, 2011). "Evanescence's Amy Lee Jumps Off Bridge in 'What You Want' Clip". Billboard. New York. Archived from the original on March 19, 2013. Retrieved September 14, 2011. ^ "Hot/Modern/AC Future Releases – Hot Adult Contemporary Songs and Release Dates". All Access. Archived from the original on July 21, 2014. Retrieved October 7, 2011. ^ "R&R :: Going For Adds :: CHR/Top40". Radio & Records. November 1, 2011. Archived from the original on March 15, 2012. Retrieved October 5, 2011. ^ "R&R :: Going For Adds :: Hot AC". Radio & Records. November 1, 2011. Archived from the original on March 31, 2012. Retrieved October 5, 2011. ^ "Available for Airplay: Modern Rock". FMQB. Archived from the original on June 20, 2012. Retrieved June 16, 2013. ^ "Future Releases – Alternative". All Access. Archived from the original on May 18, 2012. Retrieved May 23, 2012. ^ Goodman, William. "Evanescence talk no. 1 Debut, Next Album". Fuse TV. Archived from the original on May 8, 2012. Retrieved May 11, 2012. ^ a b c "Evanescence Reviews, Ratings, Credits". Metacritic. Archived from the original on October 13, 2011. Retrieved October 11, 2011. ^ a b Erlewine, Stephen Thomas. "Evanescence – Evanescence". AllMusic. Retrieved August 20, 2017. ^ a b Anderson, Kyle (October 5, 2011). "Evanescence review – Evanescence Review". Entertainment Weekly. Archived from the original on October 7, 2011. Retrieved October 7, 2011. ^ a b Grischow, Chad (October 12, 2011). "Evanescence: Evanescence Review". IGN. News Corporation. Archived from the original on October 25, 2011. Retrieved October 14, 2011. ^ Wood, Mikael. "Album Review – Evanescence's 'Evanescence'". Los Angeles Times. Archived from the original on October 12, 2011. Retrieved October 11, 2011. ^ a b c Prokofiev, Dane (October 19, 2011). "Evanescence: Evanescence". PopMatters. Archived from the original on October 20, 2011. Retrieved October 19, 2011. ^ a b Catucci, Nick (October 11, 2011). "Evanescence – Album Reviews". Rolling Stone. Archived from the original on October 13, 2011. Retrieved October 11, 2011. ^ a b Gundersen, Edna (October 11, 2011). "Amy Lee could lighten up a little on 'Evanescence'". USA Today. Gannett Company. Archived from the original on October 11, 2011. Retrieved October 11, 2011. ^ Battaglia, Andy (September 12, 2011). "SPIN's 26 Fall Albums That Matter Most". Spin. p. 15. Archived from the original on September 23, 2011. Retrieved September 14, 2011. ^ Anderson, Kyle; Greenblatt, Leah; Maerz, Melissa; Wete, Brad (September 8, 2011). "Evanescence, Evanescence – Fall Albums We Can't Wait to Hear". Entertainment Weekly. Archived from the original on September 26, 2011. Retrieved September 14, 2011. ^ Peisner, David. "Fall Music Preview: The Season's Hottest Albums". Rolling Stone. p. 11. Archived from the original on September 23, 2011. Retrieved September 26, 2011. ^ Florino, Rick (October 10, 2011). "Evanescence – "Evanescence" Album Review". Artistdirect. Archived from the original on October 11, 2011. Retrieved October 10, 2011. ^ Lepage, Mark (October 11, 2011). "New music Oct. 11: Björk, Radiohead, Marketa Irglova, Evanescence, Joe Jonas, Duchess Says". The Gazette. Archived from the original on October 12, 2011. Retrieved October 11, 2011. ^ Williams, Rob (October 15, 2011). "Evanescence – Evanescence Review (Wind-up/EMI)". Winnipeg Free Press. Archived from the original on September 4, 2014. Retrieved October 15, 2011. ^ Hirsh, Marc (October 10, 2011). "Evanescence, 'Evanescence'". The Boston Globe. The New York Times Company. Archived from the original on October 25, 2011. Retrieved October 21, 2011. ^ Willman, Chris (October 10, 2011). "Review: Evanescence Runs Gloom Into the Ground on 'Evanescence'". Reuters. Archived from the original on October 12, 2011. Retrieved October 11, 2011. ^ Hyden, Steven. "Evanescence: Evanescence – Music – Music Review". The A.V. Club. The Onion, Inc. Archived from the original on November 11, 2011. Retrieved November 11, 2011. ^ Montgomery, James (October 19, 2011). "Evanescence 'Thrilled' By No. 1 Billboard Debut". MTV News. Archived from the original on October 20, 2011. Retrieved October 20, 2011. ^ a b Caulfield, Keith (October 19, 2011). "Evanescence Nets Second No. 1 Album on Billboard 200 Chart". Billboard. Archived from the original on February 22, 2013. Retrieved October 19, 2011. ^ Caulfield, Keith (October 26, 2011). "Casting Crowns Scores Top Billboard 200 Debut, Adele Back at No. 1". Billboard. Los Angeles. Archived from the original on February 19, 2013. Retrieved October 29, 2011. ^ "Evanescence – Evanescence | Awards". AllMusic. Archived from the original on January 27, 2013. Retrieved August 20, 2017. ^ a b "Billboard 200 Albums – Year-End 2011". Billboard. Retrieved August 20, 2017. ^ Graff, Gary (August 21, 2012). "Five years between albums, and Evanescence is still hot". The Oakland Press. Archived from the original on October 15, 2012. ^ Otter, Charlotte (October 11, 2011). "UK Midweek Chart update: Evanescence and Rihanna sitting pretty". Music Week. Archived from the original on October 13, 2011. Retrieved October 11, 2011. ^ Jones, Alan (October 17, 2011). "UK Album Chart Analysis: Steps Ultimate Collection sells 34k". Music Week. Archived from the original on October 15, 2014. Retrieved October 17, 2011. ^ a b "British album certifications – Evanescence – Evanescence". British Phonographic Industry. August 22, 2014. Retrieved August 23, 2014. Select albums in the Format field. Select Gold in the Certification field. Type Evanescence in the "Search BPI Awards" field and then press Enter. ^ Williams, John (October 19, 2011). "Evanescence flops on charts". Jam!. Archived from the original on May 24, 2012. Retrieved October 19, 2011. ^ a b "Canadian album certifications – Evanescence – Evanescence". Music Canada. January 12, 2012. Retrieved January 15, 2012. ^ a b "Australiancharts.com – Evanescence – Evanescence". Hung Medien. Retrieved October 16, 2011. ^ a b "ARIA Charts – Accreditations – 2012 Albums". Australian Recording Industry Association. Retrieved June 16, 2012. ^ a b "Amazon.com: エヴァネッセンス: エヴァネッセンス: 音楽" (in Japanese). Amazon.com. Amazon Inc. Retrieved October 2, 2011. ^ a b c "Evanescence (Deluxe Version) by Evanescence – Preorder". iTunes Store (US). Archived from the original on September 24, 2011. Retrieved October 2, 2011. ^ "Evanescence: Evanescence Deluxe Edition (CD + DVD-Video)". EMI. Retrieved September 8, 2011. ^ "Rankings" (in Spanish). Argentine Chamber of Phonograms and Videograms Producers. Archived from the original on July 26, 2011. Retrieved November 8, 2011. Insert "Ranking Semanal Pop" and "01/10/11". ^ "Austriancharts.at – Evanescence – Evanescence" (in German). Hung Medien. Retrieved October 19, 2011. ^ "Ultratop.be – Evanescence – Evanescence" (in Dutch). Hung Medien. Retrieved October 14, 2011. ^ "Ultratop.be – Evanescence – Evanescence" (in French). Hung Medien. Retrieved October 14, 2011. ^ "Evanescence Chart History (Canadian Albums)". Billboard. Retrieved August 20, 2017. ^ "Czech Albums – Top 100". ČNS IFPI. Note: On the chart page, select 201141 on the field besides the word "Zobrazit", and then click over the word to retrieve the correct chart data. Retrieved August 20, 2017. ^ "Danishcharts.dk – Evanescence – Evanescence". Hung Medien. Retrieved October 21, 2011. ^ "Dutchcharts.nl – Evanescence – Evanescence" (in Dutch). Hung Medien. Retrieved October 14, 2011. ^ "Evanescence: Evanescence" (in Finnish). Musiikkituottajat – IFPI Finland. Retrieved August 20, 2017. ^ "Lescharts.com – Evanescence – Evanescence". Hung Medien. Retrieved October 19, 2011. ^ "Offiziellecharts.de – Evanescence – Evanescence" (in German). GfK Entertainment Charts. Retrieved October 19, 2011. ^ "Official Cyta-IFPI Albums Sales Chart – Εβδομάδα 43 (22–28/10)/2011" (in Greek). CYTA. Archived from the original on January 25, 2012. Retrieved October 20, 2011. ^ "GFK Chart-Track Albums: Week 41, 2011". Chart-Track. IRMA. Retrieved October 14, 2011. ^ "Italiancharts.com – Evanescence – Evanescence". Hung Medien. Retrieved November 11, 2011. ^ エヴァネッセンス | エヴァネッセンス [Evanescence | Evanescence] (in Japanese). Oricon. Retrieved August 20, 2017. ^ "Evanescence – Evanescence". mexicancharts.com. Hung Medien. Archived from the original on April 17, 2012. Retrieved October 31, 2011. ^ "Charts.org.nz – Evanescence – Evanescence". Hung Medien. Retrieved October 18, 2011. ^ "Norwegiancharts.com – Evanescence – Evanescence". Hung Medien. Retrieved October 23, 2011. ^ "Oficjalna lista sprzedaży :: OLiS - Official Retail Sales Chart". OLiS. Polish Society of the Phonographic Industry. Retrieved October 21, 2011. ^ "Portuguesecharts.com – Evanescence – Evanescence". Hung Medien. Retrieved October 20, 2011. ^ Культура: Неубранная елка [Culture: Unharvested tree] (in Russian). Lenta.ru. February 3, 2012. Retrieved May 12, 2013. ^ "Official Scottish Albums Chart Top 100". Official Charts Company. Retrieved August 20, 2017. ^ "Spanishcharts.com – Evanescence – Evanescence". Hung Medien. Retrieved October 24, 2011. ^ "Swedishcharts.com – Evanescence – Evanescence". Hung Medien. Retrieved October 21, 2011. ^ "Swisscharts.com – Evanescence – Evanescence". Hung Medien. Retrieved October 18, 2011. 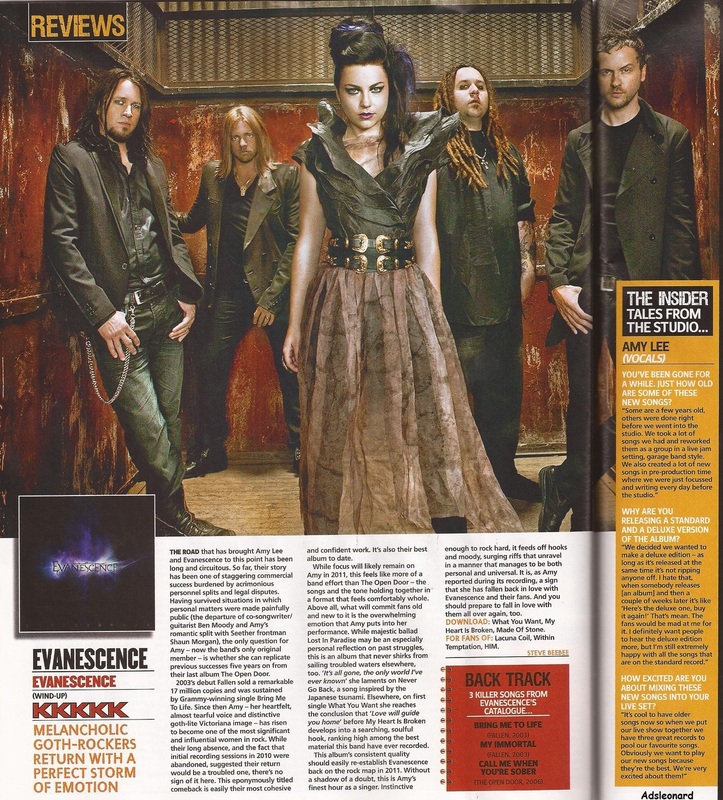 ^ "Evanescence | Artist | Official Charts". UK Albums Chart. Retrieved August 20, 2017. ^ "Official Rock & Metal Albums Chart Top 40". Official Charts Company. Retrieved August 20, 2017. ^ "Evanescence Chart History (Billboard 200)". Billboard. Retrieved August 20, 2017. ^ "Evanescence Chart History (Top Alternative Albums)". Billboard. Retrieved August 20, 2017. ^ "Evanescence Chart History (Top Hard Rock Albums)". Billboard. Retrieved August 20, 2017. ^ "Evanescence Chart History (Top Rock Albums)". Billboard. Retrieved August 20, 2017. ^ "Top 100 Album-Jahrescharts – 2011" (in German). GfK Entertainment. Retrieved August 20, 2017. ^ "Swiss Year-End Charts 2011". swisscharts.com. Hung Medien. Retrieved August 20, 2017. ^ "Official Albums Chart" (PDF). UKChartsPlus. 2011. p. 9. Retrieved August 20, 2017. ^ "Alternative Albums – Year-End 2011". Billboard. Retrieved August 20, 2017. ^ "Hard Rock Albums – Year-End 2011". Billboard. Retrieved November 20, 2015. ^ "Rock Albums – Year-End 2011". Billboard. Retrieved November 20, 2015. ^ "Billboard 200 Albums – Year-End 2012". Billboard. Retrieved August 20, 2017. ^ "Alternative Albums – Year-End 2012". Billboard. Retrieved August 20, 2017. ^ "Hard Rock Albums – Year-End 2012". Billboard. Retrieved August 20, 2017. ^ "Rock Albums – Year-End 2012". Billboard. Retrieved August 20, 2017. ^ "Evanescence - Evanescence". JB Hi-Fi. Archived from the original on April 2, 2012. Retrieved October 3, 2011. ^ "Evanescence". Amazon.de (in German). Retrieved August 25, 2011. ^ "Evanescence - Evanescence". Apple.com. iTunes. Archived from the original on July 17, 2014. Retrieved October 8, 2011. ^ "Evanescence announce tracklisting for their new self-titled album". NME. September 21, 2011. Archived from the original on September 24, 2011. Retrieved September 28, 2011. ^ "Evanescence". Empik.com (in Polish). Archived from the original on June 29, 2013. Retrieved October 24, 2011. ^ "Evanescence [CD]". Amazon.fr (in French). Retrieved June 22, 2013. ^ "CD: Evanescence: Evanescence (2011)". iMusic.dk (in Danish). Archived from the original on October 6, 2014. Retrieved July 12, 2013. ^ "Evanescence". Bol.com (in Dutch). Archived from the original on October 6, 2014. Retrieved July 13, 2013. ^ "Evanescence: Evanescence". Amazon.com. Amazon Inc. Retrieved August 30, 2011. ^ "Evanescence [+Digital Booklet]". Amazon.com. Retrieved November 20, 2015. ^ "Evanescence". Amazon.it (in Italian). Retrieved June 22, 2013. ^ "Evanescence (Deluxe Edition)". Amazon.ca. Retrieved June 25, 2013. ^ "Evanescence: Evanescence". EMI.fi (in Finnish). EMI. Archived from the original on May 18, 2012. Retrieved October 19, 2011. ^ "Evanescence - Evanescence". Apple.com. iTunes (in Swedish). Archived from the original on July 12, 2013. Retrieved October 12, 2011. ^ "Evanescence (CD+DVD)". Mixup.com (in Spanish). Archived from the original on October 18, 2011. Retrieved October 24, 2011. ^ "伊凡塞斯:伊凡塞斯(CD+DVD) [套装]". Amazon.cn (in Chinese). Retrieved June 27, 2013. Look up evanescence in Wiktionary, the free dictionary. This page was last edited on 11 April 2019, at 20:07 (UTC).